Please excuse the briefness but just wanted to send a quick hello from the long weekend -- hope you're enjoying it with good friends! We're experiencing quite a warm February week here in San Francisco so I'm eager to get outside and enjoy it in Golden Gate Park. 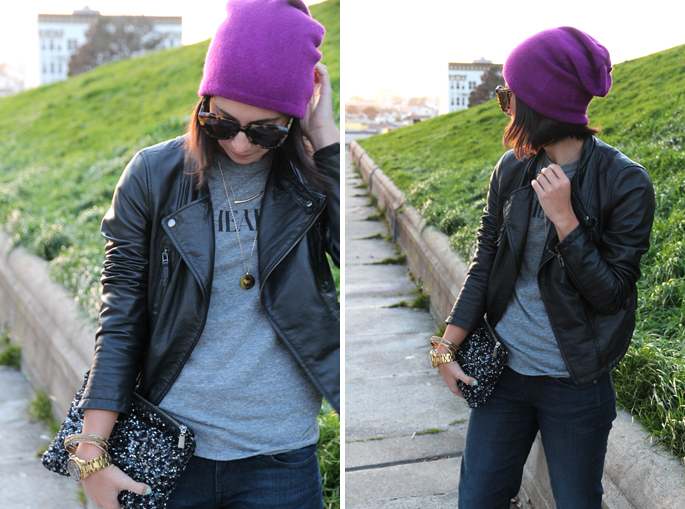 I absolutely love that beanie! I love this lay back look. Enjoy the park woman as I'm enjoying your outfit! lloovvee this look. that beanie is so rad. Gorgeous I love this outfit! I love seeing all your dressy work outfits, but it's nice every once in a while to see something more casual like this! love the hat & jacket! and i never got to tell you that i love the haircut! it fits you well! do you ever think about taking pics without sunglasses? just curious. Love this! Your shoes are fabulous. This is SO cute, Krystal! I love how casual & edgy it is! The hat is adorable on you, and love the touch of glam with the shoes! I like the shoes mixed with this look! So cute and down to earth! Love the beanie hat! I would love to see more of these casual outifts!! the hat is so great! love how it adds color to your outfit. I'm definitely stealing this fabulousness for the next weekend! Hope you don't mind! Absolutely love the hat, it's such a beautiful color! Oh that is so cool! I'd never thought of wearing heels with that outfit! Love how you've mixed casual with the heels/clutch! Awww that beanie is too cute! This is so cute!! So different from what you usually post which is great! 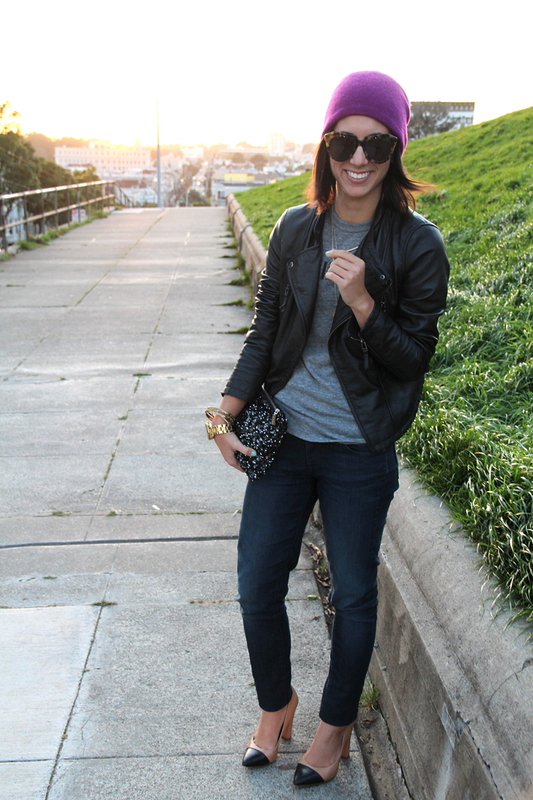 It's always nice to see the versatility that bloggers can have. You are ROCKING that purple hat! I love seeing you in such a casual outfit - you look great!